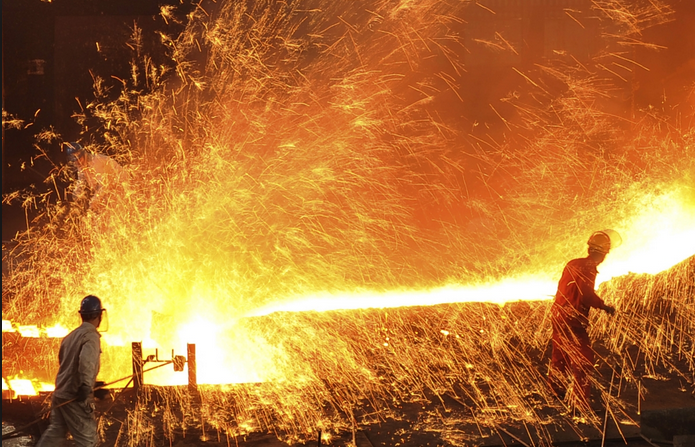 On behalf of UNITE, Survation polled attitudes to the state of the UK steel industry, the sharp fall in global steel pricing and the resulting UK job losses. Full tables are available here. 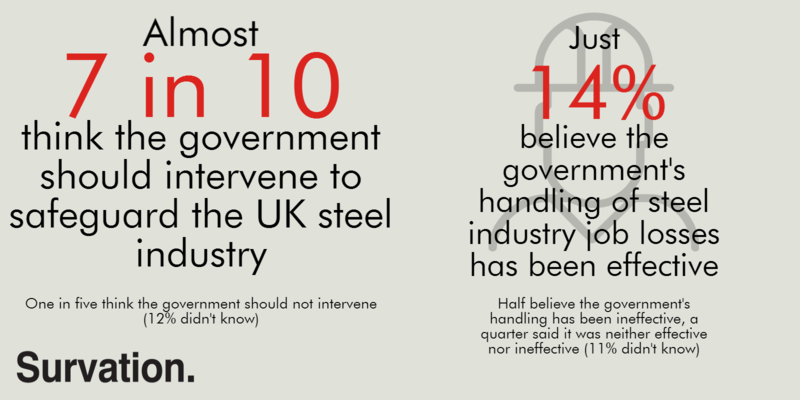 Our polling of 1,013 GB adults aged 18+ from 27th-28th October 2015 found just 14% of people believe that the government’s handling of job losses in the British steel industry was considered “effective” with half stating that the government’s handling has been “ineffective”. A quarter say that the government’s handling has been neither effective nor ineffective, whilst 11% don’t know. 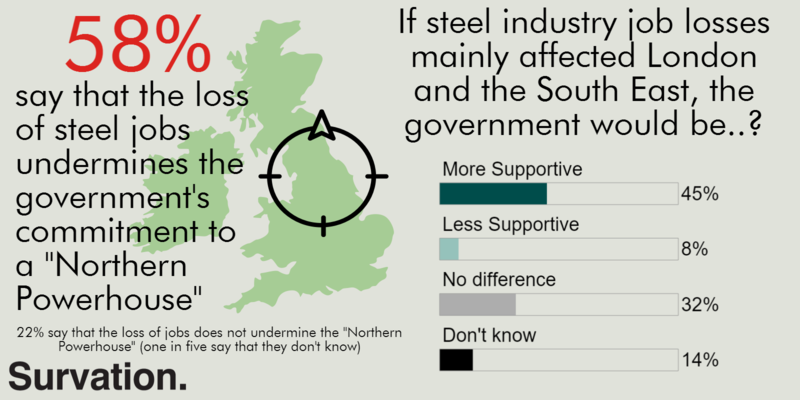 Attitudes toward potential sources of state assistance generally crossed political lines, with voters from all parties considering that publically funded construction contracts should support UK produced steel rather than procurement of the cheapest available steel by 75% to 13%. A majority (58%) of the public told Survation the recent loss of jobs primarily located in the north of England, as well as Scotland undermines the government’s commitment to creating a “Northern Powerhouse”. Just over one-in-five (22%) believe that these job losses has not undermined this commitment, a further 20% don’t know. Despite 11 Consecutive Quarters Of UK GDP Growth, half of the public when asked do not feel that the economy is recovering in their local area with only third (36%) saying that they feel an economic recovery locally 50% feeling none and 14% saying they don’t know. Over two-thirds (68%) of the public told Survation that the government should intervene in the industry to ensure it’s long-term survival, with only one-in-five saying that the government should not intervene and respect the consequences of global market forces. Looking at the North more specifically, while (58%) of all regions told Survation the recent loss of jobs in the north and Scotland undermined the government’s commitment to creating a “Northern Powerhouse” vs 22% saying it did not, this figure rose to 68% in the North and Scotland when job losses are being felt. Do the public think the government would be more supportive if the job losses affected an industry based mainly in London and the South East of England? 45% of the public thought the government would be more, with just under a third (32%) saying the government’s response would be no different wherever the affected industry was based. In the North of England itself these figures were 54% and 10% respectively. Are 11 Consecutive Quarters Of GDP Growth Cutting Through To Perception? Stark Regional Differences. More broadly, half of the public do not feel that the economy is recovering in their local area despite eleven consecutive quarters of GDP growth, with only a third (36%) saying that they feel an economic recovery locally and 14% saying that they don’t know. While employment statistics show improvement in UK job numbers, less than a third of those polled in all regions (29%) felt that there are enough “good-quality” jobs for people in their local area, with three-in-five (59%) saying that there are not enough good-quality, local jobs, 12% not knowing.